Painting can be a tedious task, rushing through and not being prepared before your first brush stroke can be even more cumbersome. We will be going over some of our techniques for proper prep work before exterior painting. You always want a clean surface when painting. Scraping the old loose paint is key, and a technique that works well is to scrape along the course of the wood grain. Doing this will assist in avoiding damage to the siding. Sanding areas that are uneven and also the rust of nail heads will help your project look smoother and more professional. An easy fix for small nail holes, punctures, etc. can be remedied by a finger scoop of caulking. The difference between the time it will take for the caulk to dry depends on the type of caulking you use. We suggest an acrylic latex caulk, typically taking 2-4 hours to fully dry before you can apply your paint. You want to stay away from 100% silicone caulking, paint will not adhere to this type. To double check how “paintable” the caulking is, you can typically spot on the label whether it says non-paintable, or paintable. An important but sometimes overlooked prep task is taping off your sections. Obviously there are areas which you do want painted and others which you do not. 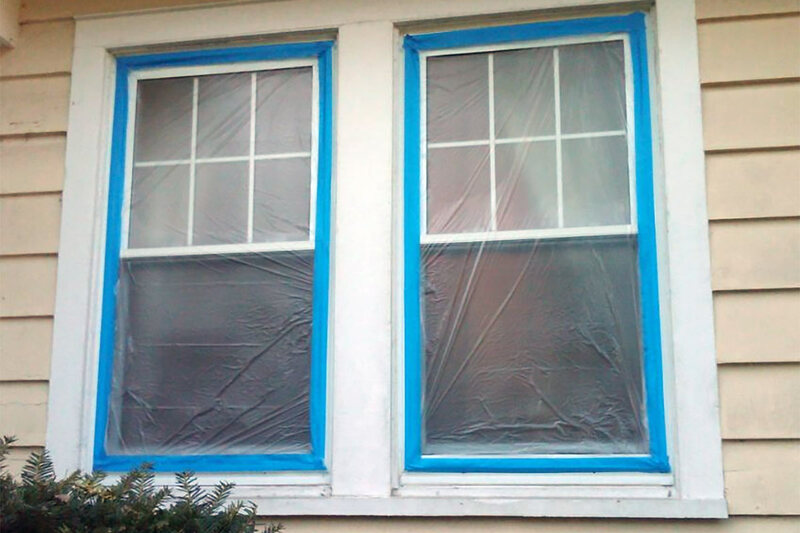 Investing in a nicer painter tape like 3M will be well worth your dollar in the long run. Stay away from store brand tapes; many times they are not sticky enough to stay on for the time you need your paint to dry. Lastly, and one of the most important things you will want to do is place a drop cloth or plastic tarp underneath painting areas to decrease cleanup. Scraping off paint from concrete and other flooring is not the way you want to spend the last day of your project. Be smart, think ahead, and take your time. Trying to paint with an oil-base below 40 degrees Fahrenheit will get you in trouble; the paint will not form a good enough film. Also with this type of paint, if applied in above 90-degree weather, it will leave you with bubbles, blisters and possible peeling after the paint is cured. If using a latex base, 50°- 85° F is the range you want. Be comfortable when you’re painting and schedule for optimal weather!